Fearscape #2 is out 11/7. By Zack Quaintance — Fearscape #1 debuted last month(ish) as a bonafide hit, selling out, necessitating a second printing, and earning copious praise from comic book creators and reviewers (many—if not all—of whom are aspiring creators too) alike. This was, perhaps, unsurprising. Fearscape’s first issue spoke directly to the feeling of yearning to be an inspired creative genius, and, well, falling short. Simply put, us readers had been there. It was painfully relatable emotional territory for the book’s target audience: monthly indie comics folks. That familiar state of mind was then expertly accompanied by a high stakes fantasy quest in another realm (which most indie comics folk also enjoy), and—BOOM!—narrative dynamite. 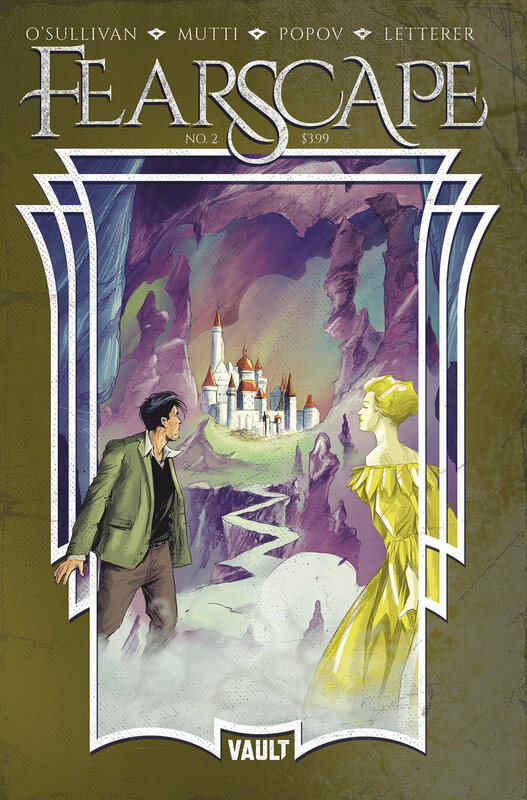 A first issue as good as Fearscape’s is a blessing and curse, though, reeling in the audience while setting the bar almost impossibly high for a follow up. In other words, some regression is to be expected. The same tricks that felt so surprising in the debut are less effective. There’s a bit of that in Fearscape #2, but the smart initial construction of this book’s tone, plus an equally smart twist at this issue’s end, make for another thoroughly engaging read. And really, I haven’t stopped being impressed yet with the pitch-perfect narrative voice writer Ryan O’Sullivan has created, nor the way he uses it. To recap: protagonist Henry Henry (perfect name for a writer, the Guy in Your MFA Twitter couldn’t have done better) went to the home of his bed-bound mentor and stole a manuscript to pass off as his own. Before he successfully absconded with the work, he found himself confronted by a ghostly extra-dimensional muse recruiting Earth’s best storyteller to represent mankind in a fantasy realm called the Fearscape, where storytelling ability is needed to stave catastrophe off from afflicting the real world. The plot is enough to make for compelling comics. Fearscape, however, adds a deeper character layer with the way it portrays its protagonist’s roiling imposter syndrome. Henry Henry constantly overcompensates with his pretentious narrative voice while outwardly acting like a total jackass. You can see why he does and says things, and it makes sense, even if you can’t help but resent him for it. Here’s a great example: an early sequence has Henry Henry brusquely telling his guide, Try to keep up, muse...followed in the next panel by this narration [The asthma attack which immediately followed the prior scene has been omitted for the sake of narrative cohesion.] It’s creative, meta, narratively-effective, and riddled with self-resentment. It’s perfect. Fearscape continues to read as if O’Sullivan is taking a deep inventory of the worst and ugliest parts of his own motivation to create...then cranking them to 11 and putting them in a comic. You can practically feel the self-loathing (in a good way), especially as Fearscape #2 comes to its conclusion. And it’s this sincerity that separates this story from the hacky work it worries it may become. This book is rich with words and ways of thinking seemingly culled from ghosts of painful undergraduate creative writing workshops. These moments emotions are honest, staggeringly so. Andre Mutti is also just such a versatile artist, given a chance to really shine in the fantasy landscapes and characters found in this issue. Mutti’s character designs are impressive, but it’s the level of clarity the artist’s storytelling techniques lend to the ending sequence (which has real potential to confuse) that really stand out.